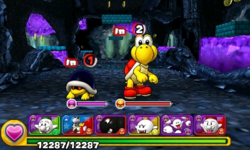 World 2-1 is the first course of World 2 in Puzzle & Dragons: Super Mario Bros. Edition. It is a basic, underground level with enemies consisting of Buzzy Beetles and Koopa Troopas. Clearing this course once unlocks the Skill Up spot at Toad Houses. This level is straightforward, consisting of two battles, a ? Block, two more battles and a boss fight at the end with two Red Koopa Paratroopas. The player has only Fire, Water, Wood, Light and Heart Orbs on the Orb field. ★World 2-1 is a difficult version of World 2-1 from ★World 2, with Dark Orbs appearing on the Orb field while Fire Orbs do not. This page was last edited on August 13, 2017, at 18:27.